In her first middle-grade novel, award-winning picture book author and illustrator Angela Dominguez tells a heartwarming story based on her own experiences growing up Mexican-American. Stella Diaz loves marine animals, especially her betta fish, Pancho. But Stella Diaz is not a betta fish. Betta fish like to be alone, while Stella loves spending time with her mom and brother and her best friend Jenny. Trouble is, Jenny is in another class this year, and Stella feels very lonely. When a new boy arrives in Stella's class, she really wants to be his friend, but sometimes Stella accidentally speaks Spanish instead of English and pronounces words wrong, which makes her turn roja. Plus, she has to speak in front of her whole class for a big presentation at school! But she better get over her fears soon, because Stella Díaz has something to say! 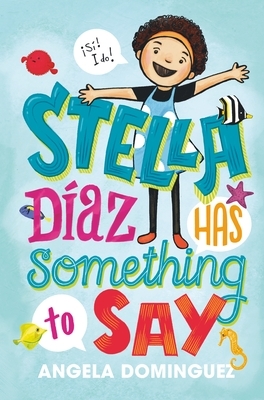 Stella Díaz Has Something to Say introduces an infectiously charming new character with relatable writing and adorable black-and-white art throughout. Simple Spanish vocabulary is also integrated within the text, providing a bilingual element. Angela Dominguez was born in Mexico City, grew up in the great state of Texas, and now resides on the east coast. She is the author and illustrator of several books for children including Maria Had a Little Llama, which received the American Library Association Pura Belpré Illustration Honor. Recently, she received her second Pura Belpré Honor for her illustrations in Mango, Abuela, and Me written by Meg Medina. When Angela is not in her studio, she teaches at the Academy of Art University, which honored her with their Distinguished Alumni Award in 2013. She also enjoys presenting at different schools and libraries to all sorts of ages. Angela is a proud member of SCBWI, PEN America, and represented by Wernick and Pratt Literary Agency. As a child, she loved reading books and making a mess creating pictures. She's delighted to still be doing both. “An inspiring tale of self-discovery. Stella Diaz speaks for anyone who has struggled to juggle different sides of their identity. Which is, of course, all of us.” —Minh Le, author of Let Me Finish!